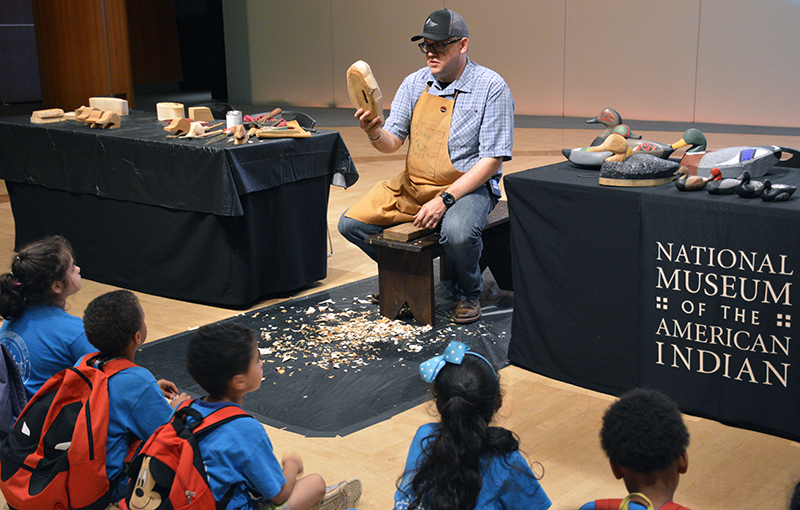 Young visitors from a New York City area summer camp watch as Joshua Hinson carves and paints a duck decoy at the National Museum of the American Indian. Not just anybody gets an invitation to put on a live exhibition at a national museum in New York City, but that is exactly what happened to ACU graduate Joshua Hinson (’01), also known as Lokosh in the Chickasaw language, which he speaks and teaches. Joshua lives and works in Ada, Oklahoma, the seat of government for the Chickasaw Nation. He is studying for a doctorate in Native Language Revitalization at the University of Oklahoma while working with the Chickasaw Language Revitalization Program as his job. But Joshua’s invitation to New York City came because of his reputation for creating authentic duck decoys, which actually are used in duck hunting, but also are artistic. An artist all his life, Joshua just started creating duck decoys a couple of years ago. In that short time, he has made a name for himself on a national level. “It helps when you’re an artist,” he said. 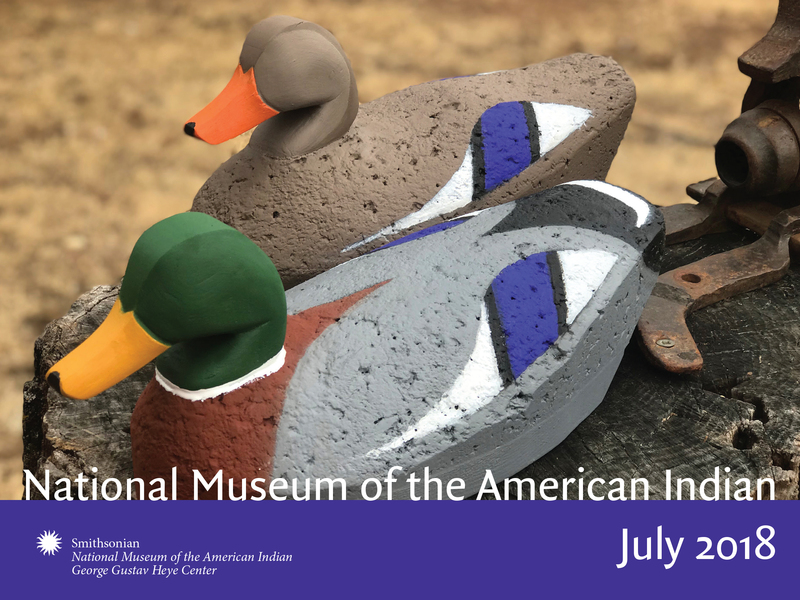 Joshua’s invitation was for July 17-19 at the Smithsonian National Museum of the American Indian – New York, the George Gustav Heye Center. It is located in the historic Alexander Hamilton U.S. Custom House in lower Manhattan. Joshua maintains close ties to ACU. He is married to Mika Freeman Hinson (’00), who graduated with a degree in music education. Their oldest son, Levi, will be a freshman in the fall. Joshua grew up in Abilene while his father, Waymon Hinson, now retired, was a professor. At ACU, Joshua earned a degree in fine arts, with a concentration on painting. He credits his art professors Robert Green (’79) and Jack Maxwell (’78) with helping him become the successful artist he is today. Maxwell helped him to think like a sculptor, creating art in three dimensions, while Green helped him understand colors and how they match and blend. “He really taught me how to think critically about a painted surface,” Joshua said of Green. Invitation to the live exhibition by ACU alumnus and American Indian artist Joshua Hinson. Joshua is interested in the history of his culture as well as the art. He earned a master’s degree in Native American Art History from the University of New Mexico after leaving ACU. Making decoys originated with Native Americans, who taught the skill to colonists. When Joshua decided to make his own decoys, he got help from two mentors in North Carolina, who taught him the right tools and techniques to use. Making decoys was and is common among the Native Americans on both coasts, Joshua said. Joshua’s interest stems from a duck hunting trip a few years ago. He now makes life-size decoys that hunters purchase and miniature ones that art collectors like. He sells his work on his website, www.lokosh.com, and by word of mouth, not in stores. Joshua’s “day job” is working on a project with the Chickasaw Language Revitalization Program in Ada. The program partnered with Rosetta Stone, a leading language learning software program, to create a educational tool for preserving the language. To date, 81 of the eventual 160 video-based lessons have been created and are available. It would be hard for Joshua to say which he enjoys more, creating duck decoys or working on the language revitalization program, which has its own rewards. Learn more about the Department of Art and Design.